High seismicity associated with the 29 April-1 May swarm activity has continuously declined since late May (figure 1). An average of one volcanic earthquake/day was recorded in June, compared to 43/day in April and 5/day in May. No surface activity was observed. Figure 1. Daily number of earthquakes at Gede, April-May 1991. Courtesy of VSI. The Global Volcanism Program has no Weekly Reports available for Gede-Pangrango. A swarm of 100 volcanic earthquakes (40 deep and 60 shallow) was recorded on 29 April, an increase from the previous daily average of 10-15 events. Tectonic earthquakes averaged 1-2/day. Seismicity had been increasing since February. No surface activity was observed. Three shocks were felt (intensities I-III) on 30 April. Seismicity later returned to normal levels (10-15 events/day) during the second week of May (table 1). Table 1. Number of earthquakes at Gede, May 1991. Courtesy of VSI. Gede volcano is one of the most prominent in western Java, forming a twin volcano with Pangrango volcano to the NW. The major cities of Cianjur, Sukabumi, and Bogor are situated below the volcanic complex to the E, S, and NW, respectively. Gunung Pangrango, constructed over the NE rim of a 3 x 5 km caldera, forms the high point of the complex at just over 3000 m elevation. Many lava flows are visible on the flanks of the younger Gunung Gede, including some that may have been erupted in historical time. The steep-walled summit crater has migrated about 1 km NNW over time. Two large debris-avalanche deposits on its flanks, one of which underlies the city of Cianjur, record previous large-scale collapses. Historical activity, recorded since the 16th century, typically consists of small explosive eruptions of short duration. This volcano is located within the Cibodas, a UNESCO Biosphere Reserve property. Situmorang T, Hadisantono R D, 1992. Geologic map of Gede volcano, Cianjur, West Java. Volc Surv Indonesia, 1:50,000 geol map. There is data available for 26 Holocene eruptive periods. There is no Deformation History data available for Gede-Pangrango. There is no Emissions History data available for Gede-Pangrango. Gede volcano, seen here from the NE, is one of the most prominent in western Java, forming a twin volcano with Gunung Pangrango. Many lava flows are visible on its flanks, including some that may have been erupted in historical time. The steep-walled summit crater has migrated about 1 km to the NNW over time. Two large debris-avalanche deposits on its flanks record previous large-scale collapses of Gede volcano. 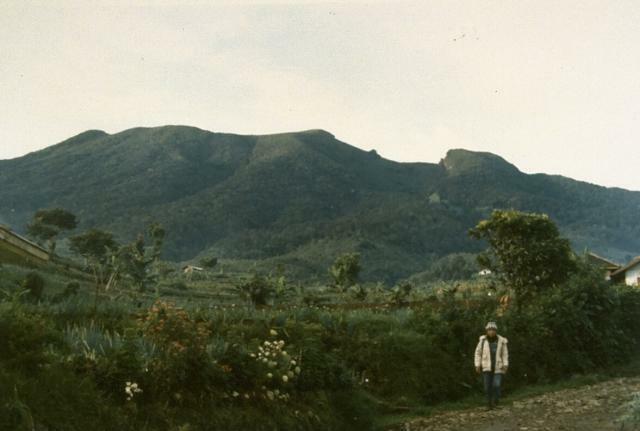 Photo by Ruska Hadian, 1990 (Volcanological Survey of Indonesia). A thick lava flow is truncated by the summit crater of Gede volcano. The 1-km-wide summit crater of Gede has migrated to the NNW, and contains several smaller craters. Photo by Sunaman (Volcanological Survey of Indonesia). 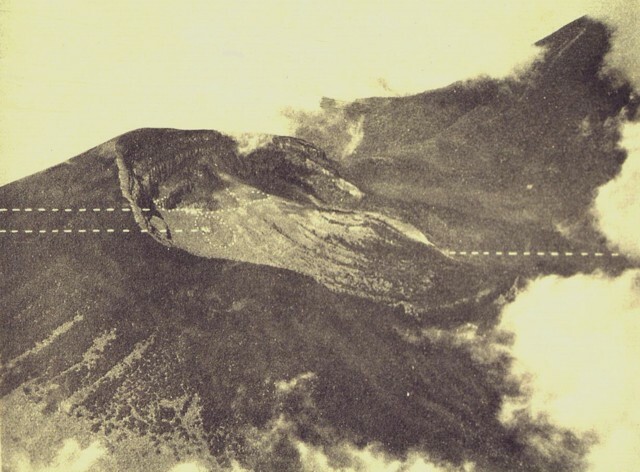 An aerial view from the NE shows the summit crater (right) of Gede volcano. The summit cone was constructed within an older crater, whose western rim forms the peak at the left. The sparsely vegetated moat area between the two cones is known as Alun-Alun. Photo from Taverne, 1926, "Vulkaanstudien op Java," (courtesy of Volcanological Survey of Indonesia). 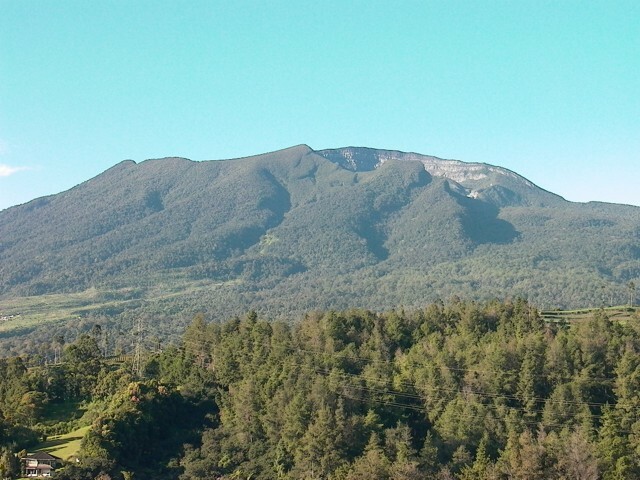 An aerial photo shows the partially forested summit of Gunung Gede volcano from the east. The two left-hand dashed lines show the locations of Kawah Ratu (top) and Kawah Lanang craters (bottom), and the right-hand dashed line marks the site of Kawah Wadon crater. 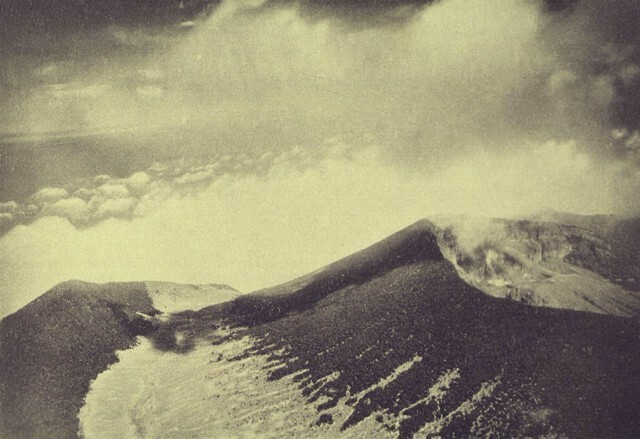 The slopes of Gunung Pangrango, a twin volcano of Gede, appear at the upper right. 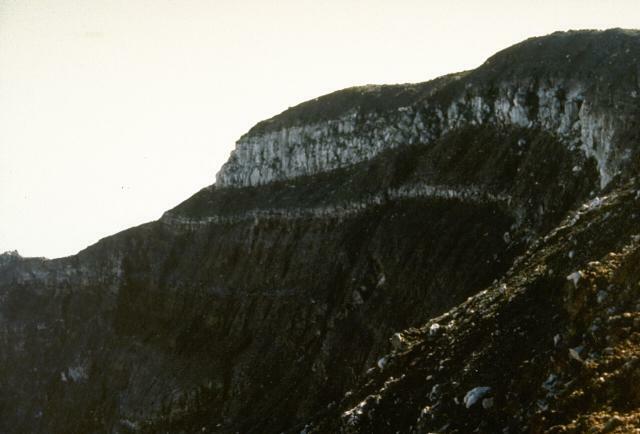 The steep-walled summit crater (right) of Gede cuts the broad summit of the volcano. Gunung Gede is one of the most prominent volcanoes in western Java, forming a twin volcano with Pangrango volcano to the NW. Many lava flows are visible on the flanks of the younger Gunung Gede, including some that may have been erupted in historical time. Historical activity, recorded since the 16th century, typically consists of small explosive eruptions of short duration. Photo by Cahya Patria, 2004 (Centre of Volcanology & Geological Hazard Mitigation, Volcanological Survey of Indonesia). IRIS seismic stations/networks Incorporated Research Institutions for Seismology (IRIS) Data Services map showing the location of seismic stations from all available networks (permanent or temporary) within a radius of 0.18° (about 20 km at mid-latitudes) from the given location of Gede-Pangrango. Users can customize a variety of filters and options in the left panel. Note that if there are no stations are known the map will default to show the entire world with a "No data matched request" error notice. Large Eruptions of Gede-Pangrango Information about large Quaternary eruptions (VEI >= 4) is cataloged in the Large Magnitude Explosive Volcanic Eruptions (LaMEVE) database of the Volcano Global Risk Identification and Analysis Project (VOGRIPA).